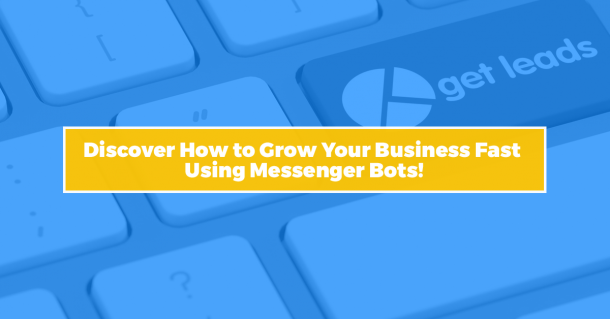 Discover How Smart Local Businesses Are Using Messenger Bots to Grow Their Business Fast! What are Messenger Bots, and Why Do Local Businesses Need Them? Messenger bots have been taking the online marketing world by storm for years now. But what are they? And does your local business really need them? Messenger bots are robots that can carry on a conversation with a customer and interact with them just as an actual human being would. They can handle small customer service tasks, process payments, book reservations, and more. Online users are already becoming familiar with these types of bots because today, they appear on so many websites in the form of chatbots that pop up when a user lands on the site. Messenger bots are different than these chatbots though. This is because they don’t appear on websites but instead, inside messaging apps such as Facebook Messenger (the largest of the messenger bot market), Twitter, WhatsApp, and more. Whenever a customer wants to message your business through these apps, the messenger bot will appear, or the customer will subscribe to speak to the bot. Most of these bots are run by local businesses and if you don’t currently have one, you could be missing out. The biggest reason for this is just that – so many local businesses are using them! And that includes your competitors that may be just down the street, or just around the corner. If you’re not, and the competition is, customers may decide to leave your company when they can’t get ahold of you right away, but there is always someone (or something) to talk to them at the competitor. Local businesses that don’t get in on the trend of using messenger bots now are simply going to be left behind. It’s said that by the year 2020, and that’s not too far off, 85 percent of business to customer interactions will be done with no human interaction at all. At that time, there’s no telling just what messenger bots will look like, interact like, and what other advancements will be made. Local business will do much better getting in on this trend now instead of waiting and finding out too far down the road that they waited too long. Why Use a Messenger Bot? When a messenger bot is working for a business, the business owner doesn’t need to be available 24/7. Customers can still make purchases and get answers to their questions without any wait, and without getting frustrated that the business isn’t available to help them. Businesses always want to learn more about their customers so they can provide them with the products and services they really need. Messenger bots allow you to see what your customers are asking, how they’re interacting with the bot, and generally get to know them better. Not only do messenger bots not cost a bundle to create, but business owners can choose how much they want to spend on creating their bot. Once the bot is up and running, there’s virtually no cost to maintain it and whatever costs there are, they’ll still be very low. Literally millions of people use messaging apps every day. When a business uses a messenger bot within these apps, that’s millions of people making up their audience. There are very few other types of online marketing, or business services for that matter, that can boast that same kind of reach. As a business owner, it’s impossible to deal with every customer at once. While you can get to all of them, it takes time. And people can become frustrated by the wait. Messenger bots are the answer. They can handle hundreds of requests simultaneously without limits. • 73 percent of customers prefer live chat boxes rather than calling a company on the phone or emailing. Small businesses can hear more from their customers, and reply to their needs, by utilizing a messenger bot. • It is predicted that by the year 2020, 85 percent of interactions between a customer and a business will not involve human interaction. This means businesses that don’t get in the trend now will be left behind. • The global messenger bot market is expected to reach $1.23 billion by the year 2025. That means messenger bots will soon lose their novelty status and be the status quo in business. 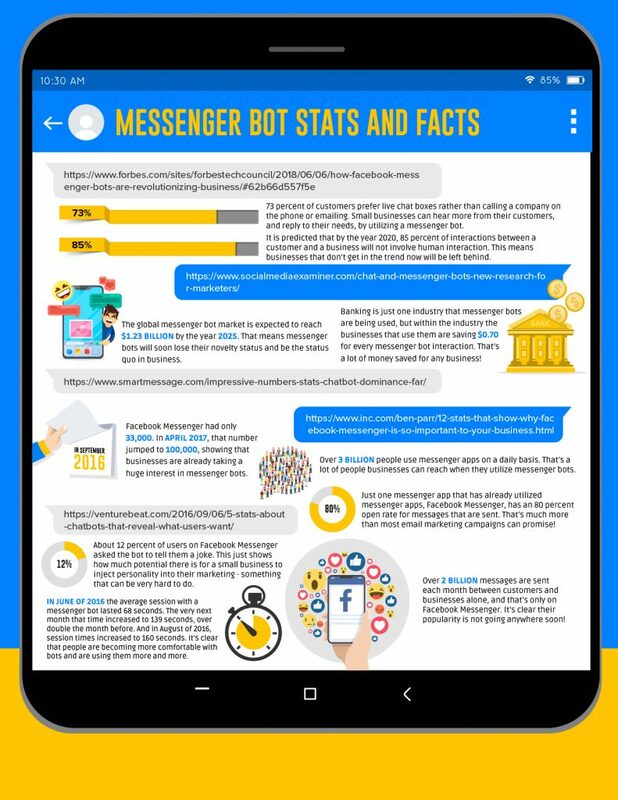 • Banking is just one industry that messenger bots are being used, but within the industry, the businesses that use them are saving $0.70 for every messenger bot interaction. That’s a lot of money saved for any business! • In September 2016 Facebook Messenger had only 33,000. In April 2017, that number jumped to 100,000, showing that businesses are already taking a huge interest in messenger bots. • Over 3 billion people use messenger apps on a daily basis. That’s a lot of people businesses can reach when they utilize messenger bots. • Just one messenger app that has already utilized messenger apps, Facebook Messenger, has an 80 percent open rate for messages that are sent. That’s much more than most email marketing campaigns can promise! • Over 2 billion messages are sent each month between customers and businesses alone, and that’s only on Facebook Messenger. It’s clear their popularity is not going anywhere soon! • About 12 percent of users on Facebook Messenger asked the bot to tell them a joke. This just shows how much potential is there for a small business to inject personality into their marketing – something that can be very hard to do. • In June of 2016, the average session with a messenger bot lasted 68 seconds. The very next month that time increased to 139 seconds, over double the month before. And in August of 2016, session times increased to 160 seconds. It’s clear that people are becoming more comfortable with bots and are using them more and more.